Extremely cold weather in the Northeast have caused natural gas shortages, forcing residential and commercial buildings to rely on diesel generators for heat and power. 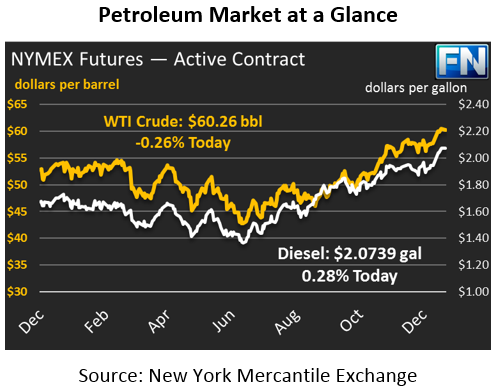 That helped to boost NYMEX diesel prices well above $2.00 last week. A terrorist group in Libya blew up a pipeline that carries 70-100 kbpd of crude oil from southern Libya to the Mediterranean. The outage helped propel Brent crude oil prices, widening the Brent-WTI spread to over $7 at times. Overall, last week saw gains of $2.02 (3.5%), rising from $58.40 to $60.42. Today oil prices remain above $60, though with some downside bias. Crude prices are currently trading at $60.26, down from Friday’s close. Protests in Iran have contributed to higher oil prices, as we’ll discuss below. Diesel markets are feeling the effects of diminishing supplies and robust demand. Diesel prices rose 11.2 cents (5.7%) last week thanks to strong winter chills, especially in the Northeast. 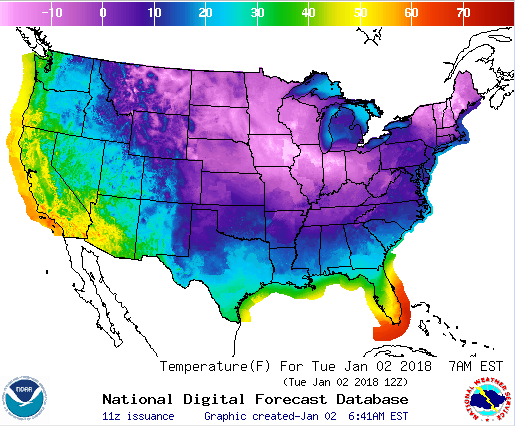 Temperatures in all but the warmest points in the country (Florida and the West Coast) are below freezing, with sub-zero temperatures experienced throughout the Midwest and Northeast. All that cold weather is causing strong demand for diesel fuel, as well as creating diesel fuel operability concerns. Contact a Mansfield Winter Fuel Expert to validate your winter diesel plans. Diesel prices are currently up half a cent, trading at $2.0739. Gasoline only gained 4.6 cents last week, a “meager” 2.6%, dragged down by continued stock builds last week. Refineries have been pumping out fuels at rates well above seasonal averages, which have kept consumers well supplied. 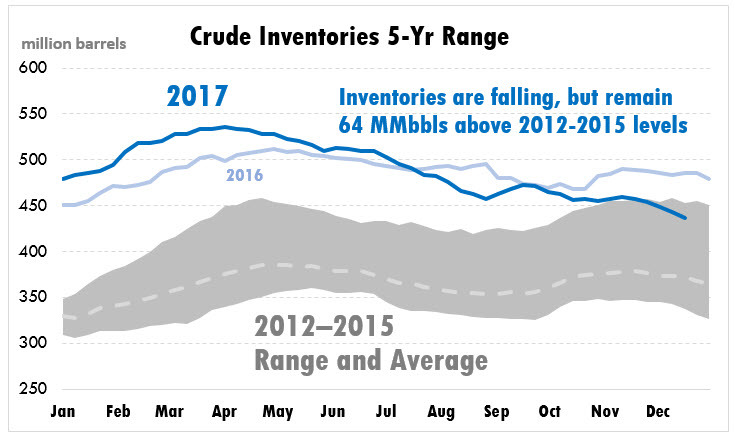 Winter gasoline costs typically stagnate as demand falls. Like crude, gasoline is trading lower this morning, shedding 0.8 cents to trade at $1.7876. The past week has been full of bullish headlines, from pipeline outages to strong demand numbers. The headlines continued – protests in Iran are escalating this week as citizens take to the streets against Iran’s ruling class. So far, the protests have been smaller than protests in 2009, when millions took to the street protesting Iran’s election. This time around, tens of thousands, spread throughout the country without a defined leader, are protesting economic conditions and calling for an end to the Iranian regime. So far the protests have not disrupted oil flows, but markets are rising out of fear that production could fall offline. On the other side of the spectrum, the pipeline in Libya damaged last week has resumed operations, as has the Forties Pipeline System in the U.K. which had been offline for weeks. With both pipelines back in operations, Brent-WTI crude spreads have fallen from $7 last week to $6.34 today.